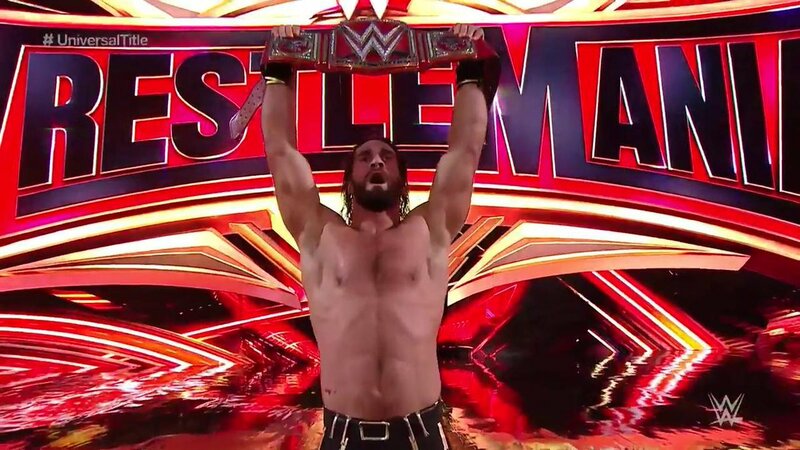 WrestleMania 35: Seth Rollins Vs. Brock Lesnar (WWE Universal Title Match) - Wrestling Inc.
Hogan and Bliss are doing their poses when Paul Heyman suddenly comes marching out from the back, making the long walk from the stage to the ring. Heyman his client is not on last tonight, then he's not hanging around here all night to wait. They aren't happy about Lesnar not being in the main event it appears. Heyman says they're getting their business done, then taking a jet to Las Vegas where his client is ultimately appreciated. Heyman says let's get this nonsense over with because we're doing it right here, right now. Fans pop as Heyman begins the introduction for WWE Universal Champion Brock Lesnar, screaming the whole thing. The music hits and out comes Lesnar to a pop. Out next comes Seth Rollins. Rollins hits the apron to enter the ring but Lesnar immediately attacks him. Lesnar goes to work and drops Rollins with a huge F5 on the outside of the ring. Lesnar sends Rollins into the LED board and the barrier at ringside. The bell still has not hit. Lesnar tosses Rollins over the German announce table and stares the referee down. Rollins goes over another announce table. They come back in the ring as Heyman yells for the bell to be rang. The referee checks on Rollins. Lesnar throws Rollins right back to the floor and keeps the attack going. Lesnar laughs after destroying Rollins some more. They return to the ring and the bell rings. Lesnar goes right to work and delivers the first German suplex. Lesnar talks trash to the camera and tosses another German. Rollins ends up hitting Lesnar with a low blow after Lesnar almost runs into the referee and he ends up on the outside. Rollins hits The Stomp for a big pop. Rollins delivers a third Stomp and covers for the pin to win the title.